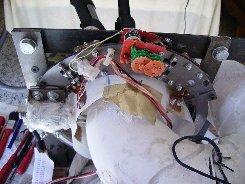 Abstract : Description and photos of the device designed and built to mechanise grooves to wind modular coils at low cost. The device is a kind of milling machine working in toroidal coordinates. It was moved semi-automatically during the process but it could be totally automated with minor improvements. The device was patented to know the degree of originality. The results are satisfactory because a notable accuracy of the grooves has been obtained. The device is able to mechanise grooves on the toroidal surface of one stellarator. As a result the mechanization and positioning of the coils is the same procress, reducing the total errors in the obtained magnetic field. Even the use of a 5 axis milling machine require the division of the surface of the toroid in a minimum of 6 pieces. The cost is very high and later the pieces need to be jointed together like for example in CTH torsatron. Very accurate and expensive methods and instruments are necessary to measure the position of the pieces or coils. An intense mental effort was done to choose the best option to avoid any expensive process. Finally, after some previous tests, it was decided to built this machine which works both as a mechanising and measuring device. Moreover the work to locate the coils disappear. Obviously this method is not easily, and perhaps impossible, applicable to reactors or large stellarators but it was a useful tool for UST_1 stellarator. However for example Farrokh Najmabadi  comments : "It appears that the out-of-plane force are best supported by a continuous structure"", see Figure 1. Thus the idea of a continuous mechanised surface is not so atypical even for reactors. The origin is a rough surface of plaster conformed in to halves in a polystyrene mould. The toroidal shape of the mould is created by a hot wire adapted to the same device to mechanise modular coils. The rough surface is mechanised using the same device. The layer of plaster is 15mm thick at least. A groove of 7mm width is produced. The accuracy is relatively high, errors are smaller than ~0.3mm as described in . The groove is 12.5mm in depth but only 10.5mm will be occupied by the conductor. The rest could be used if the coils are expanded. The machine is composed of two different structures, the "Toridal base", see Photo 1, which supports the stellarator and the poloidal guides. One is the "Poloidal fixed guide" designed to support the "Poloidal rotation guide" which rotates without play on the fixed one. The poloidal fixed guide is a ring cut in two halves and they have two special limits to form the original exact circular ring. A series of bearings are used to allow only one degree of freedom. The "Toridal base" rotates around an inferior vertical axis soldered to the ground base and so the stellarator rotates toroidally. Accurate coordinates are printed on the toroidal base to allow measuring and positioning (it should be electronic measurement). The "Poloidal rotation guide" is movable continuously 360º around a poloidal plane of the torus. The idea is to mechanise all the grooves without moving the torus from the support so to obtain the same accuracy that the milling machine. Normal milling machines are very accurate, far more accurate than the coils after positioning, even in an excellent stellarator like W7-X. Here it is a very low cost milling machine and the accuracy is only regular but enough to achieve notable accurate magnetic field because positioning of coils does not exist. 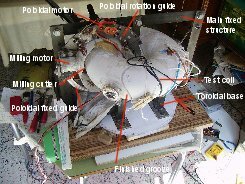 The poloidal turn is produced by a small and slow geared motor of variable speed. It needs ~1 hour to turn 360º and so to mechanise one coil. The idea is to mechanise coils in only one pass of milling cutter so to imitate a machine to make tunnels. The positioning of the toroidal base is manual by now but the average accuracy is better than 0.2º. However, if manually operated, some shifts (max 0.5mm sometimes) around the central theoretical line are produced along 1-3mm of groove and then it returns to the exact location. It has little impact on the magnetic field accuracy because the conductors cannot twist as much and they follow an average line. The torus is supported by 4 legs so one leg can be removed when the area around the leg is being mechanised. The torus remain always fixed. The device can be conceived in different mechanical structures. These ideas and more information can be seen in the patent application form (perhaps not publised yet). "Status of the coil system. One modular coil finished" Vicente Queral , See "List of all past R&D" in this web. Photo 1 . Device to mechanise grooves for modular coils on toroidally-circular winding surfaces (possible general 3D surfaces if improved). Figure 1 . Idea proposed in  by Farrokh Najmabadi. Photo 2 . Poloidal movable guide which supports most of the elements of the device.